HOLYOKE: Howard B. Ford, Sr., age 87, of Holyoke, passed away suddenly on Monday, December 03, 2018 at his home. He was born in Worcester and lived in Holyoke most of his life. Howard was a retired brakeman/conductor for the B & M Railroad. He was a communicant of St. Jerome Church, a member of the Ancient Order of Hibernians and the Holyoke Lodge of Elks #902. 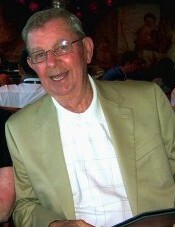 Howard was an outstanding high school athlete and was a member of Holyoke Catholic's first football team in 1947. He is survived by his wife of 67 years, Margaret A. (Griffin) Ford; two sons: Howard B. Ford, Jr. of Holyoke and Robert F. Ford of FL; two daughters: Cynthia M. Miles and her husband Steven of CT and Margaret A. Destromp and her husband Frederick of Holyoke; 8 grandchildren: Steven Miles, Jr, Daniel Miles (Jennifer), Patrick Motto (Michelle), Christopher Motto (Bryanna), Meghan Leppanen (Jeremy), Fred Destromp, Jr. (Lhea), Scott Destromp, Melissa Anderson (Drew); 7 great grandchildren: Carter Scott, Ryan, Sean and Leah Motto, Grace, Alice, and Violet Destromp; a son-in-law, John Motto of West Springfield and several nieces and nephews including Michael Ford of Holyoke, and Thomas Ford of CA. Howard was predeceased by his parents, Thomas and Mary Ford, and 13 siblings; an infant daughter, Mary Felicia Ford, and a daughter, Sharon Motto. The Funeral will be held on Friday, December 7, 2018 at 9:00 a.m. from the Barry J. Farrell Funeral Home, 2049 Northampton Street followed by a Mass at 10:00 a.m. in St. Patrick Chapel of St. Jerome Church, Hampden Street. Burial will follow in St. Jerome Cemetery. Calling hours will be held on Thursday, December 6th from 4:00 to 7:00 p.m. Memorial contributions may be made in Howard's memory to Jericho, Bureau for Exceptional Children and Adults, PO Box 1039, Holyoke MA 01041.